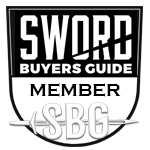 i am new here and need to ask for your help, as I have never done that before and this is one of my only two swords in my collection. It’s the Frostmourne Replica from Epic Weapons which I already own for about ten years (think it was released in 2008). Unfortunately the genuine leather wrapped handle doesn’t look good anymore. Seems like the leather lost its color or got some dirt on it. Also it got a little loose an the top. I don’t know if there is a way to wrap the handle completely new or if I just should recolour the leather with black leather color. Oof with the rings on there I'm not sure how disassembly would work. If its threaded and those things come off, replacing would be easier. You could also try just applying some kind of leather conditioning to it and then re-dye once its gained its "elasticity". Quotes because I know that isn't the right word. Do you know what kind of conditioner I should use for this purpose? Is it dangerous, that the wraps get loose when they get more elastic? This is one of those annoying spammy videos with a person who records it in a frustrating and odd voice, but it gives you a few options. Someone here will probably have a better recommendation. I think I've seen people mention waxes that work well on leather wrapped grips, but generally the leather finish is different than that pictured. Elastic wasn't the best choice of words. Essentially if you get the leather "moisturized" (there I go with a less than ideal term again), it should expand if anything, making it tighter. But if you can get the leather less dried out and brittle, it could help. Back in the ‘60s when I was into sport cars, and mine had leather seats, I used a product called Lexol. The sun and rain and leather weren’t the best combination. The Lexol did a fine job of keeping the leather soft and did a cleaning job also as well as I remember. At that time I saw many cars with leather seats that split, but mine remained it very good condition. I just checked with Amazon to verify my memory and they carry it as well many more products that I am not familiar with. The Lexol I used came in a squeeze bottle. Saddle soap will also clean leather. Remember if you decide to shrink that leather shrinks in two directions be careful. If you can figure how the rings attach you will be way ahead as you wrap, if that’s the way you decide to go, in sections covering the join with the rings. That’s assuming you do not remove the pommel. I often wrap my leather grips with rescue tape before they show wear. Rescue tape has no adhesive and is touch friendly. I do dust the tape with mat black spray paint to hide the shine.